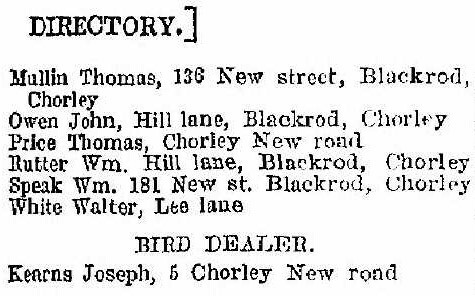 The Toll Bar Inn was built sometime in the mid-1800's and is at the junction of Chorley New Road (previously Crown Street), Lee Lane, Scholes Bank and Crown Lane. 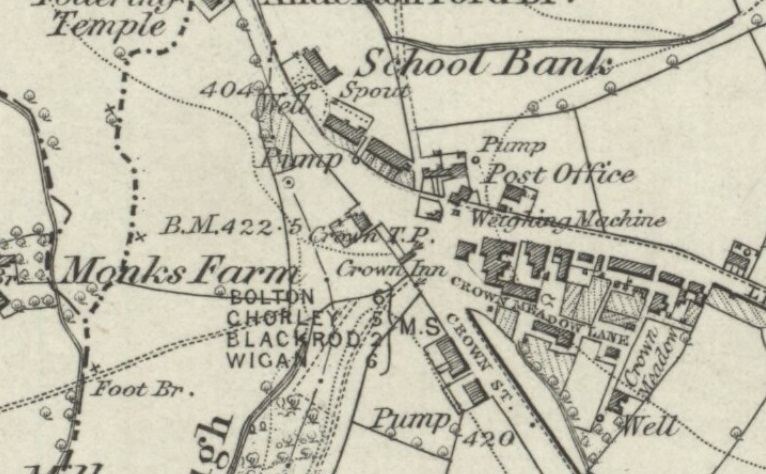 It does not appear on the 1845 map of the area but is clearly shown on the 1892 map and ones thereafter. 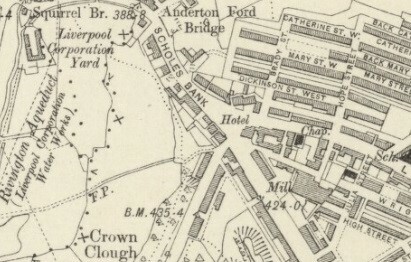 roofs indicate the remains of Eighteenth Century housing. Old Road itself was an early turnpike of 1787 with a toll recalled in the name of the public house, "The Toll Bar Inn". 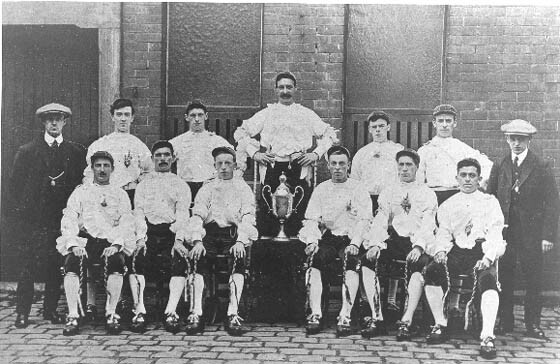 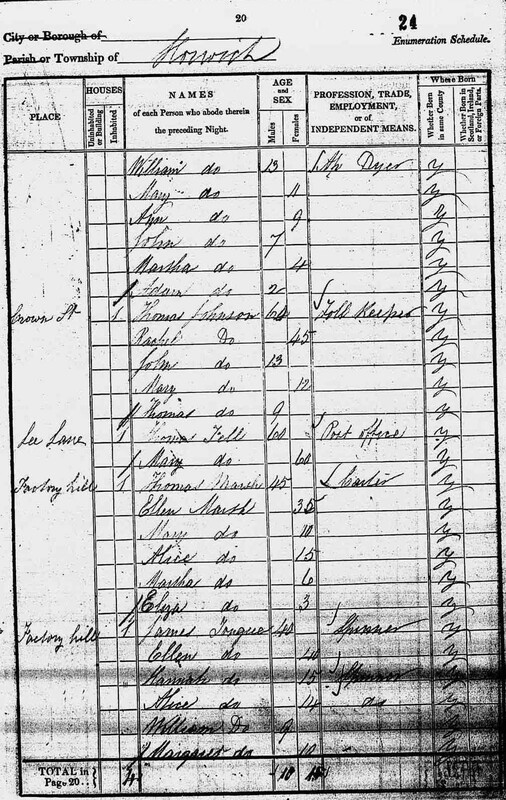 The New Road was added in 1822,some claim to provide local unemployed with labour. 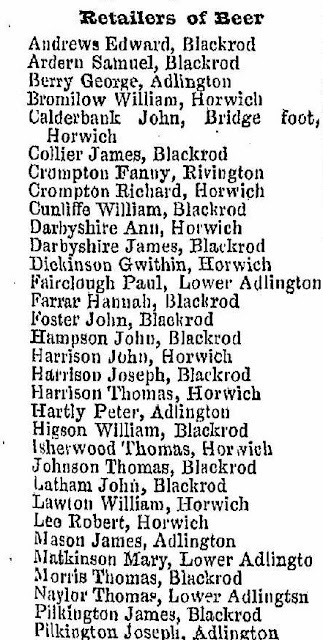 Its main significance is that in 1884 the Locomotive Works grew around it, so establishing the "second" Horwich. 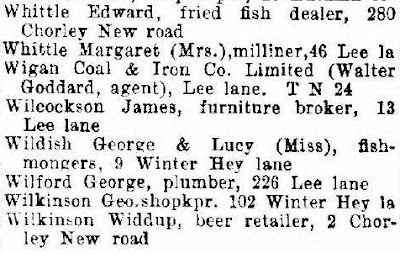 At what stage it became a beer house is not known to me, as early census entries for occupants at the property are recorded as toll collectors/keeper. 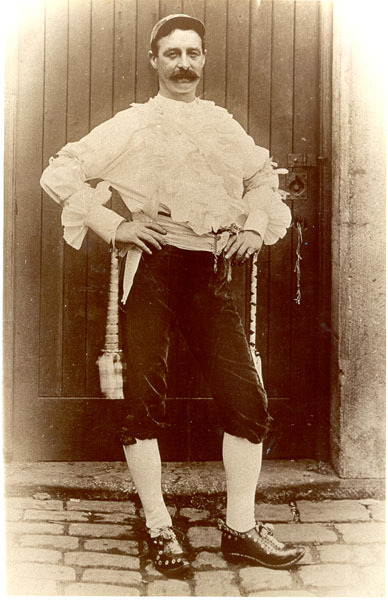 It wasn't until 1871 that the resident, Robert Lee is first shown as a beer seller. 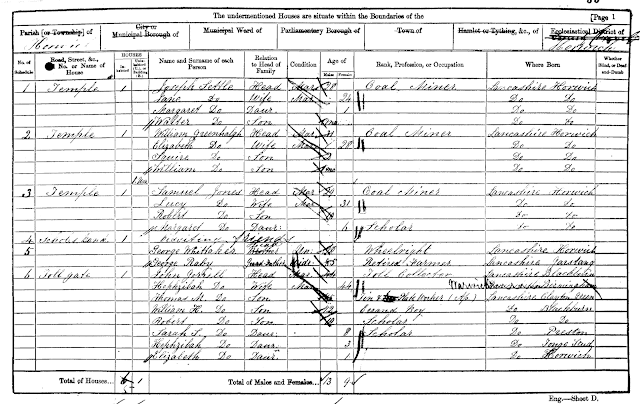 It was originally called "Toll Gate House" and whilst its primary function would have been toll collection I suspect it also doubled as a beer house for most of the second half of the 1800s. 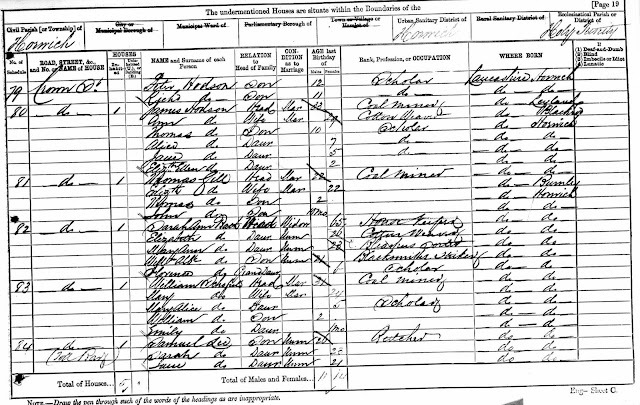 Landlords/tenants at the Toll Bar Inn were Thomas Johnson (1841), Robert France (1851-60), John Gaskell (1861), Robert Lee (1862-71), Samuel Lee (1881-90), Robert Lee (1883-86), Thomas Price (1890-99), Mary Lambert (1899-1905), James Price (1905-11), Widdup Wilkinson (1824), George & Daphne Keene (late 1970s-90s), Mark Knowles (2001-04) and Sue Beeley (2001-). 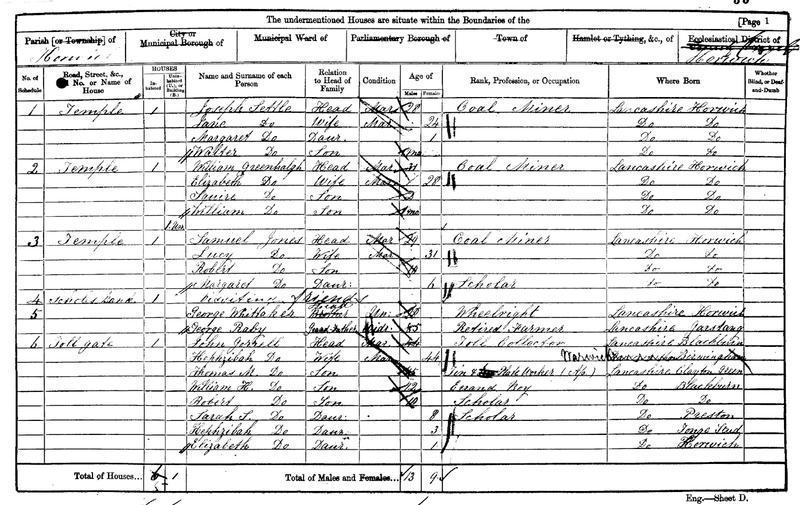 Self-destruction by a Farmer - On Monday forenoon Mr. Robert France, farmer, of Anderton, near the Crown Inn, Horwich, committed suicide in his own residence. 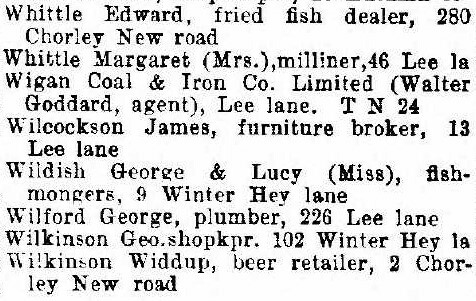 It was possibly in 1862 that a beer licence was first successfully applied for at the Toll Bar Inn and the directory records confirm that Robert Lee, who was resident at the Inn was a "Retailer of Beer" later that decade in 1869. 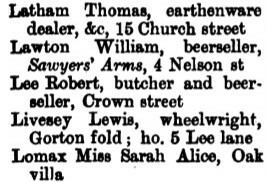 Robert Lee is again confirmed in the above directory as a butcher and beer seller, something his son Samuel was continue until 1890. On 11th August 1890 the Bolton Evening News recorded the transfer of the licence at the Toll Bar Inn, Horwich, from Samuel Lee to Thomas Price confirming that the Toll Bar was a beer house prior to 1891 when in the hands of the Lee (Leigh) family. 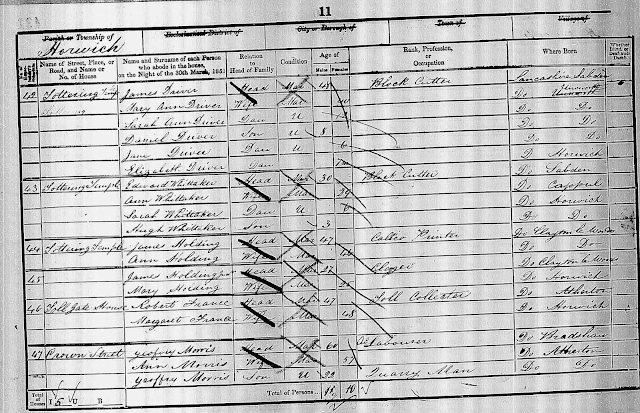 Death records show that Thomas Price died in 1899 at the tender age of 37 years leaving his wife Mary Hannah Price to bring up their children; Harry, James, Fred, Walter, Allen and May as well as running the Inn. 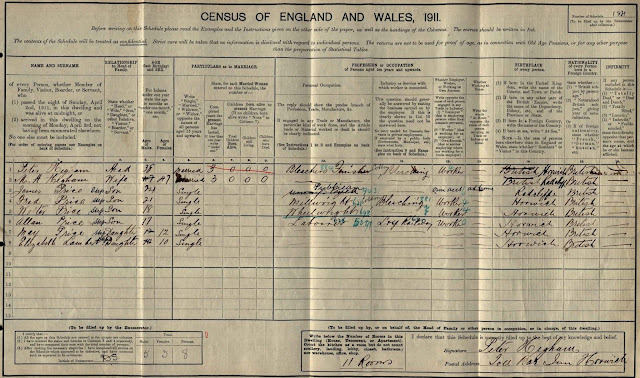 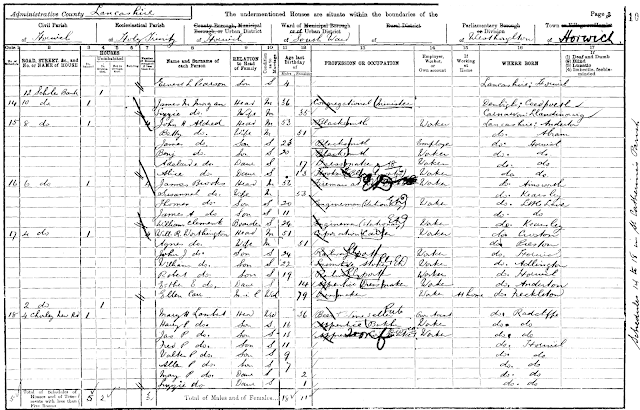 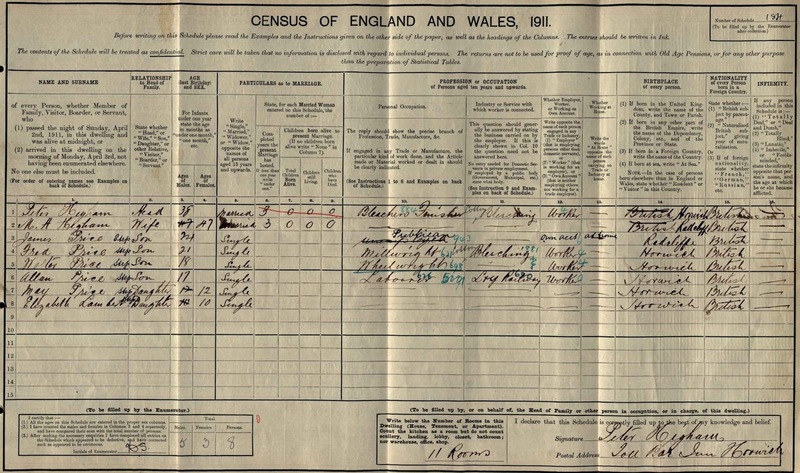 She quickly remarried in 1900 to a John C Lambert and had a further child, Lizzie Lambert but tragedy again befell her as John was also to die the same year, just 28 years old and by the time of the 1901 census she was again on her own. 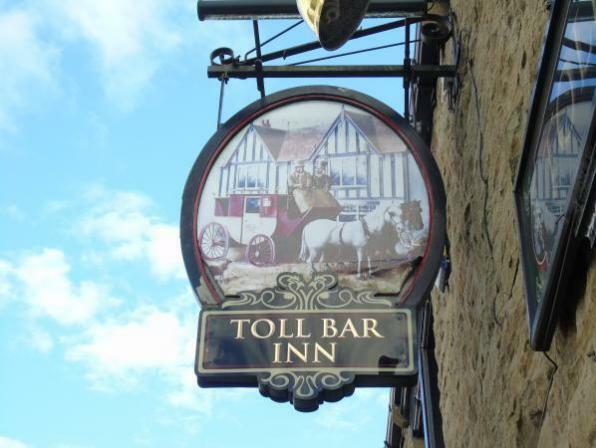 County Coroner, held inquiry this afternoon into the death of Harry Price (19), of the Toll Bar Hotel. Horwich, who died on Sunday as the result being shot in the head at the starling shoot at the Hilton Arms Hotel, Hilton House. 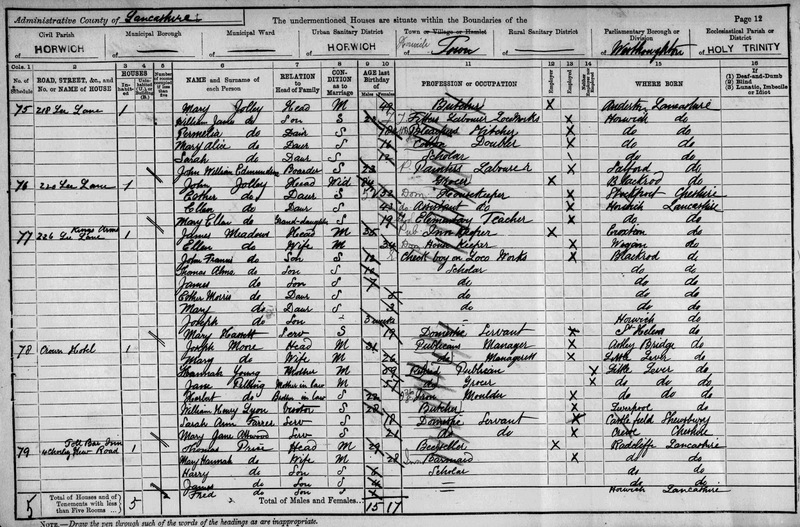 Mary endured her fair share of tragedy during her time at the Toll Bar Inn but she remained there with her family after Harry's death and in 1907 married her third husband, Peter Higham, who was a local man working as a Bleacher. 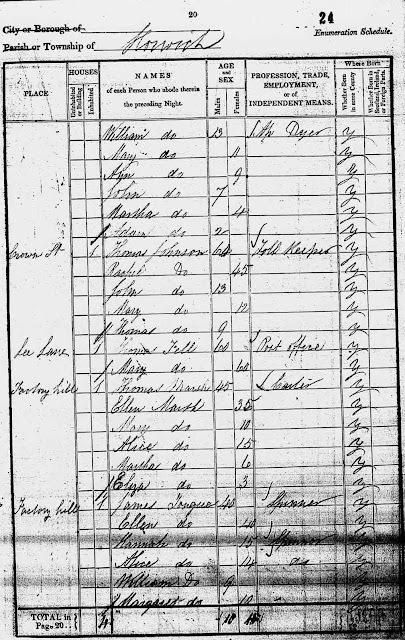 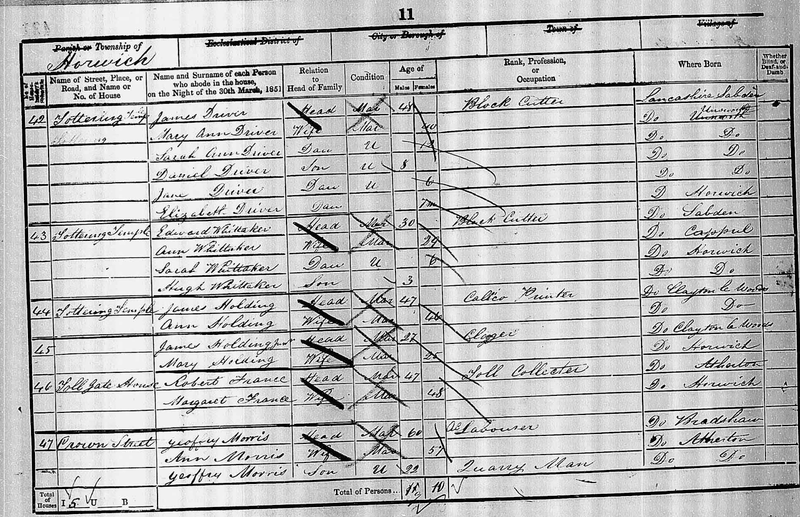 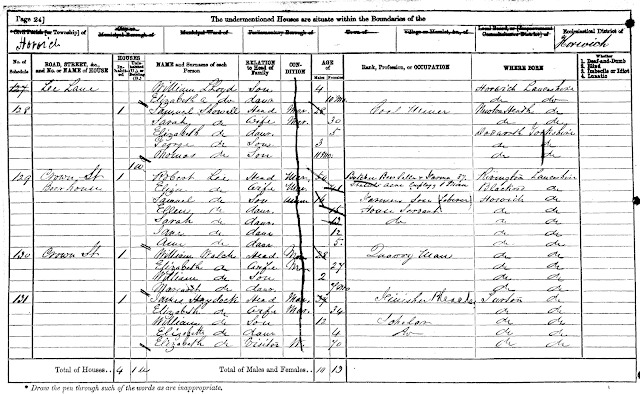 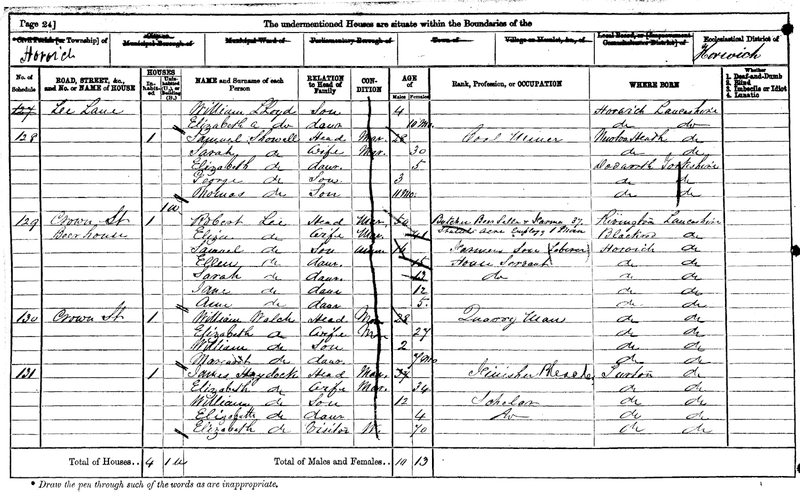 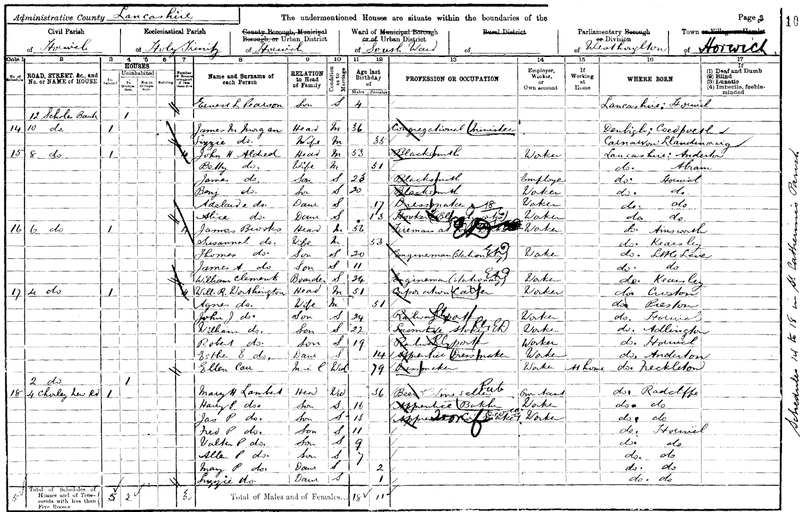 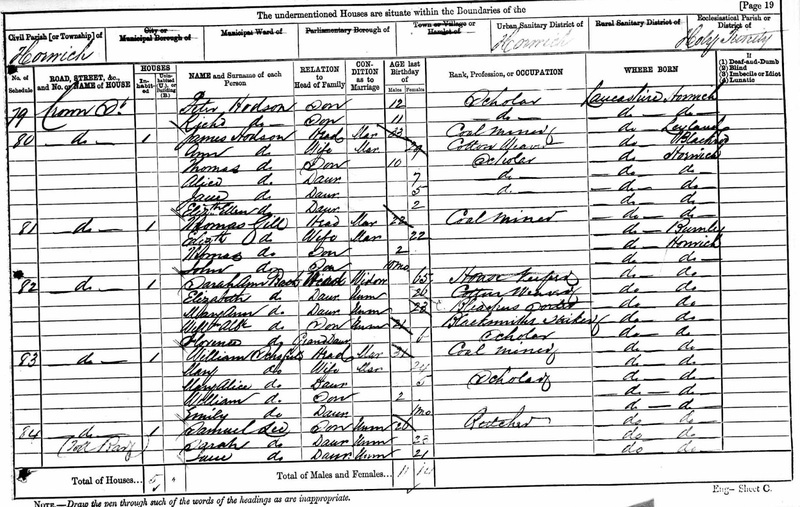 The 1911 census record below confirms they lived together as a family at the Toll Bar whilst Mary's oldest living son James ran the Inn.